Existential thought comes in an amazing variety of forms, representing an array of views on many issues. From Kierkegaard’s radical faith to Nietzsche’s radical doubt, “existentialism” is surely a child of both pluralism and controversy. Existential forms of psychology are similarly diverse in nature, representing contrasting views on numerous topics. For example, Rollo May and Viktor Frankl are often mentioned together in introductory texts where existential psychology is covered, yet they disagreed quite vehemently on the role of advice in the psychotherapeutic relationship. Examples such as these are not rare. The inherent diversity of existential thought is part of what keeps it alive and vibrant. Like phenomenology, Thomism, personalism, humanism, and other movements, the beauty, fecundity, and vitality of existentialism lies, in part, in its refusal to be painted into a theoretical corner. Nonetheless, I have found that referring to my work as existential in nature has often brought with it the assumption that I hold certain viewpoints. There is a stereotype of existentialism. Particularly among the uninitiated, I have found that “existentialism” carries with it the assumption that human beings have no essence. Human beings pick themselves up by their own ontological bootstraps, so to speak. Humans are merely what they make of themselves—that is all. On this view, human beings are defined by their radical freedom from the kinds of worldly conditions that occupy the psychologist (Rathus, 2008). Human consciousness is defined as a pure being-for-itself set against all that is being-in-itself. This is rather ironic given the length to which existential thinkers at large have gone to distance themselves from the subject-object dichotomy. No less radical is the view of interpersonal relations implied in this perspective. Being-for-others is seen as a burden for being-for-itself. This ruggedly individualistic viewpoint is best characterized by the phrase, “Hell is other people.” Finally, the entire universe is conceived as one big accidental occurrence, a meaningless collection of cosmic happenstance spiraling through space with no rhyme or reason. Thus, if life is to been seen as part of any cosmic order or as having any unifying sense, these must be imposed upon the world, posited or projected upon it from without by a solitary subjectivity standing in defiance of life’s sheer and ultimate absurdity. This set of views constitutes what I have come to call “pop” existentialism. The initiated will recognize these views as being conspicuously Sartrean in nature, and for good reason. 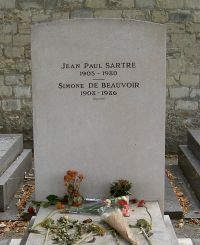 Sartre is arguably the most recognizable name in existentialism, at least among American audiences. This is unfortunate, as Sartre represents but an extreme version of existentialism that has only served to impede the ability of existential psychology to productively engage a wider audience within the discipline. The following examples illustrate this point. To be sure, the idea that human existence has no essence has served the needed purpose of mounting a serious challenge to reductionistic determinism. This remains a timely issue. Psychology still needs alternatives to reductionistic determinism at every turn, it seems. The idea that human existence has no essence has further posed an important challenge to essentialist, rationally biased models of the mind. For example, since its inception, cognitive psychology has relied heavily on computer analogies and computational models of the mind, and these models are still prevalent within the cognitive sciences. The idea that a human being is but a useless passion can act as a polemic against the intellectualized, inordinately calculative notions of consciousness posed by the mainstream of cognitive science. At the same time, this simplistic reversal of essence and existence throws the ontological baby out with the bathwater, as it were, and precludes the most creative dialogue possible with all forms of psychology that see something inherent and/or non-irrational in human existence. Since the time of Aristotle, human beings have been held to have an essence that is rational (though not in the hyper-logical or Cartesian sense), social, political, and animal in nature. Since the time of St. Thomas Aquinas, it has been recognized that these “characteristics of essence” are brought into being or “made real” via an existential act of commitment on the part of the living, breathing individual. These notions, in some manner or fashion, are important elements within the ranks of newer, contextualist strains of cognitive psychology (Hayes, 2004), various forms of humanistic psychology and Thomistic psychology (Allport, 1955 DeRobertis, 2011, 2012), ecological psychology (Plotkin, 2008), neuroscience (Siegel, 1999), and social psychology (Aaronson, Wilson, & Akert, 2013), to name a few. The emphasis on individuality (colorfully captured by the notion that hell is other people) has helped to bring issues of personal identity to the mainstream of psychology. This can be said to be beneficial to the extent that personal identity had been downplayed or neglected in certain classic views of personality and therapeutic change, such as those represented by strict Freudianism or behaviorism. In today’s world, however, individualism has increasingly come to be seen as ethnocentrically biased. In particular, the defiant individualism proposed by reactionary forms of existentialism is viewed as the byproduct of a pervasive bias within western thought (Midgley, 2005). Collectivist and anti-individualist forms of psychology, such as multicultural psychology (DeRobertis, 2014), feminist psychology (Gilligan, 1982), Afrocentric psychology (Myers, 1993) have moved beyond the inordinate focus on the individual in western psychology. Similar things can be said of the idea that human life is but a meaningless contingency nestled within a cosmic absurdity. This idea can be seen as bringing meaning to the forefront of personality and psychotherapy where classic models had all but ignored the issue (Frankl, 1969). Yet, it is vitally important to bear in mind that life is primordially meaning-laden. Indeed, the life of consciousness normally partakes of an overflowing surplus of meaning, to borrow Paul Ricoeur’s (1976) turn of phrase. Meaninglessness is a deviant form of meaningfulness. It is not correct to say that meaningfulness is a mere lack of meaninglessness (Tillich, 1952). The idea that life is fundamentally meaningless and absurd is at variance with third force, fourth force, and now “positive” forms of psychology where meaning plays a vital role in self-fulfillment. All in all, we must finally admit that psychology has outgrown the usefulness of the stereotypes of existentialism derived from Sartrean thought. Aaronson, E., Wilson, T. D., & Akert, R. M. (2013). Social psychology (8th Ed.). New York, NY: Pearson. DeRobertis, E. M. (2011). Prolegomena to a Thomistic child psychology, Journal of Theoretical and Philosophical Psychology 31(3),151-164, 2011. DeRobertis, E. M. (2012). Existential-phenomenological psychology: A brief introduction. Charleston, SC: CreateSpace, 2012. DeRobertis, E. M. (2014). Toward a humanistic-multicultural model of development. In K. J. Schneider, J. F. Pierson, & J. F. T. Bugental, (Eds.). The handbook of humanistic psychology, second edition. Thousand Oaks, CA: Sage. Frankl, V. E. (1969). The will to meaning: Foundations and applications of logotherapy. New York, NY: Nal. Midgley, M. (2005). The essential Mary Midgely. New York, NY: Routledge. Myers, L. J. (1993). Understanding an afrocentric world view: introduction to an optimal psychology. Dubuque, IA: Kendall Hunt. Plotkin, B. (2008). Nature and the human soul. Novato, CA: New World Library. Rathus, S. A. (2008). Psychology: concepts and connections. Belmont, CA: Wadsworth. Ricoeur, P. (1976). Interpretation theory: discourse and the surplus of meaning. Fort Worth, TX: TCU Press. Siegel, D. J. (1999). The developing mind: toward a neurobiology of interpersonal experience. New York, NY: Guildford. Today’s guest contributor, Eugene M. DeRobertis, PhD, is an Associate Professor of Psychology and the author of several books on existential-phenomenological psychology and child psychology. His website is http://brookdalecc.academia.edu/EugeneDeRobertis/.